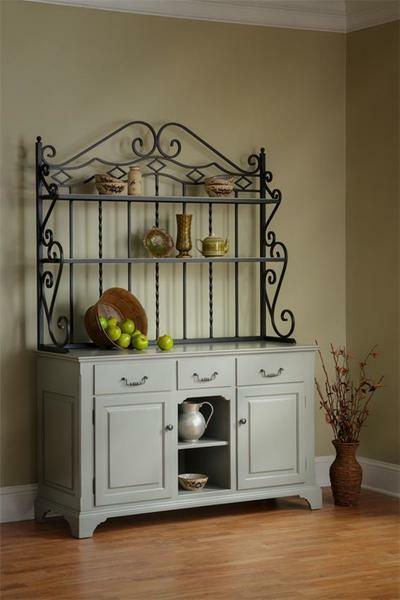 This beautiful French Country Kittrell Hutch with Bakers Rack will transform your kitchen into a traditional country theme with a timeless style that will replicate that of a farmhouse in the foothills of Northern America. The use of both the wrought iron top and solid wood base complement each other perfectly producing a stunning piece of American made furniture that is durable enough to be enjoyed by many family generations and homes. Select the style of feet, hardware, wood, and finish type to design a bakers rack buffet that fits in nicely with your home decor and meets your personal style preferences. This will be a piece that you will cherish for a lifetime and be proud to display as part of your home furniture collection. Contact our DutchCrafters team of Amish furniture experts for more information on this beautiful solid wood buffet or for custom ordering assistance. Buffet Available Without Bakers Rack. Please Call For Pricing. I received my buffet baker's rack on Sat. Mar. 25, 2006. I was completely thrilled and satisfied with the wood quality and the superb workmanship of the furniture. Thank you Linse and Carolyn for the excellent care-free service. Also, thank you to your driver Gary. He kept me posted all the way and he was very accommodating. I will surely recommend JMX to my friends.